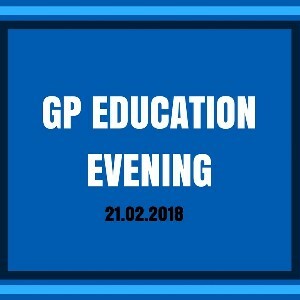 Our next GP Education evening will take place on Wednesday, 21st February 2018 in the Bon Secours Hospital Tralee. Registration will commence from 6.45pm.The theme of this event is ‘End of Life Planning’.Speakers on the night include Dr Helena Moore, Consultant Neurologist, & Clinical Director, Dr Patricia Sheehan, Palliative Care Consultant & Clinical Nurse Specialists, Ms Moira Hayes & Ms Brid O’Connor. The objective of this meeting is to share the latest clinical updates from local experts and is part of an on-going initiative to support medical education in the locality.